This distinctive-looking bird is often mistaken for a type of vulture because of its bare face and habit of eating carrion, but it’s actually a tropical falcon. Besides cleaning up roadkill, the Caracara also feeds on invertebrates and small mammals, birds, reptiles, fish, and amphibians. It’s also known to harass vultures causing them to disgorge their food, in order to steal it. 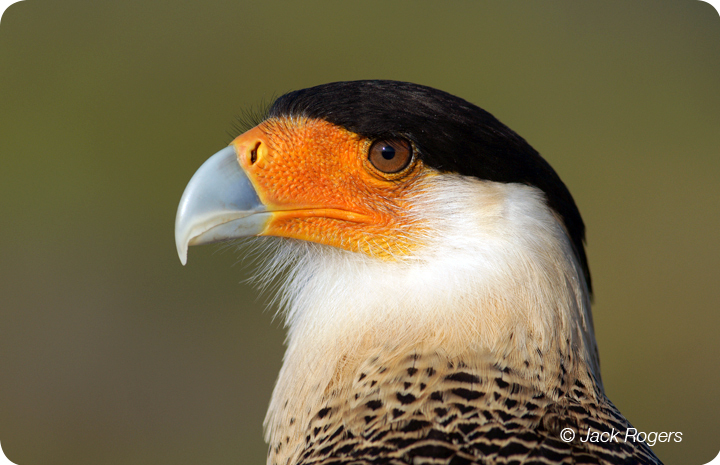 Crested Caracaras can walk easily and run fast; males engage in aerial battles during breeding season. Threatened mainly due to habitat loss, the Caracara prefers open rangeland, like cattle pasture and is often seen perching on fence posts.